We plan this workshop as an interactive event focused around the scholarship of trust. 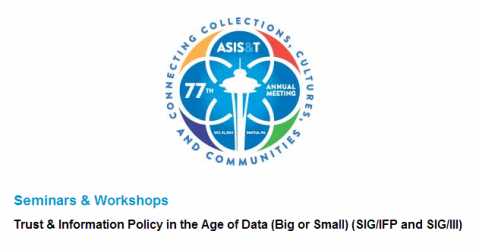 This is an opportunity for scholars to fine-tune position papers and works-in-progress as they are informed via the workshop discussions and activities, and brainstorm about methodological approaches to studying trust in the context of government and corporate use of big data, emerging technologies, and globalized infrastructures. Participants who do not present a work-in-progress or position paper, but are in attendance as a general workshop participant, will have the opportunity to further develop ideas and interests that are related to information policy, ethics, and trust. This workshop will enable participants to engage, challenge, support, and encourage each other on questions such as: the importance of trust; theorizing the concept of trust; conceptualizing trust around a set of relationships; understanding trust in the relationship between citizens and the state; reconciling trust with NSA (and other agency) surveillance; trust in international or intra-national state to state relationships; and trust in other communities, including between and among dominant and underrepresented groups in society. * How are researchers conceptualizing trust in the age of data? * How can scholars investigate infrastructures of trust? * Are understandings of trust shifting? If so, with what consequences, in which contexts? * When is trust justified? When is it not justified? Should decision-makers focus on and build trustworthiness rather than (mere) trust? * What are the economic, political and legal implications of trust in the age of data (big and small)? * How does policy design build/undermine trust? * What are the ethics of trust in the age of data? This workshop aims to bring together scholars from across the information science fields (LIS, Archives, Museums, HCI, Law, Policy) to lend their respective lens’s to a critical exploration of trust. 3) abstracts describing possible existing or novel methodological approaches to researching the relationships between data and trust in a range of contexts. tba – we will send an update. You will also be able to find this information on the main conference website! Scholarship opportunities will also be announced shortly. The registration fee will cover workshop costs, wireless Internet access, lunch and coffee breaks. Please forward any questions that you have to Kris Unsworth (unsworth@drexel.edu<mailto:unsworth@drexel.edu>) or Bryce Newell (bcnewell@uw.edu<mailto:bcnewell@uw.edu>).